Nostalgia is definitely “in” these days, and the Brooklyn Cyclones want to capitalize on it. I wasn’t all that into last year’s wildly successful Seinfeld Night promotion (what can I say, I was never a big fan of the show), but June 24th’s Saved by the Bell Night seems like a lot more fun. Friendship bracelet station on the concourse…singing “Friends Forever” will be optional. Zack Morris TIMEOUT Race Around the Bases – kids will race around the bases, but most stop in their tracks every time they hear TIMEOUT. After the game, fans with perms or wearing stonewashed jeans will be allowed to run the bases. 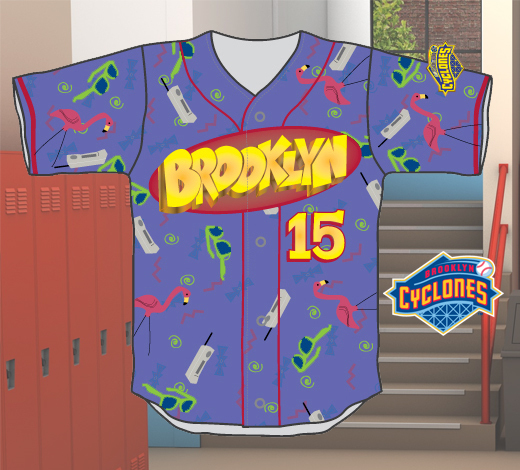 The Cyclones will be wearing wonderfully awful Saved by the Bell theme jerseys that will be raffled off throughout the game. If this sounds like fun to you too, check out BrooklynCyclones.com on Wednesday at 10 a.m. for your chance to purchase a limited-edition “Baseball to the MAX” ticket package, in honor of Bayside’s favorite eatery. The deal includes a ticket to the game, pre-game picnic (starting at 5:30 PM) and commemorative t-shirt for just $40. I wish I was a millionaire so I could monetarily force the SI Yanks to host Bill Nye The Science Guy night. Also, nothing tops the day the Cyclones had SI Swimsuit models coming to the stadium to throw the first pitch. Nothing. I’m on board with a Bill Nye the Science Guy night if any of the local teams want to do it. Ha! I’m the opposite — I loved Seinfeld night, but I have no interest in Saved By the Bell. Never got into that show.